Natural fancy blue diamonds rank near the top for being some of the rarest colored diamonds. To underscore the true extent of the rarity of blue diamonds, to date, they account for less than 0.1 percent of the total diamond yield amassed at the Premier mine in South Africa, which is responsible for producing the greatest amount of blue diamonds for the market. Further emphasizing its rarity, blue diamonds experience an entirely infrequent and inconsistent emergence from the mine in any given year. Pure Fancy Deep and Fancy Vivid Blue. Most natural blue diamonds that are mined are identified as type IIb. Unlike type I diamonds, type II diamonds are not composed of a large amount of nitrogen. Type IIb blue diamonds, in particular, contain a tell tale measure of boron that gives these diamonds their distinctive blue color. The greater the amount of boron in a fancy blue diamond, the deeper the blue color will appear. 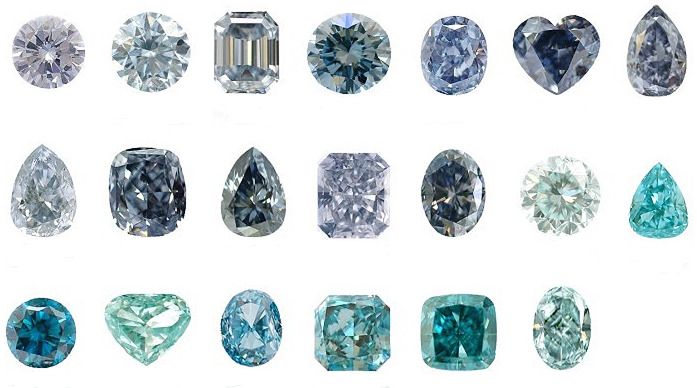 Compared to other fancy colors, blue diamonds exhibit less variety in color appearance for the same color grade because the extent of their saturation possibilities are much more limited. The saturation of a colored diamond is determined by its intensity. Differences in color appearance are therefore credited to tone, which is the particular point that a diamond falls in the light to dark spectrum. 1st row: Light Blue, Fancy Light Blue, Fancy Blue, Fancy Intense Blue, Fancy Vivid Blue, Fancy Deep Blue, Fancy Intense Violetish Blue. 2nd row: Fancy Light Grey-Blue, Fancy Grey-Blue, Fancy Dark Grey-Blue, Fancy Greyish Blue, Fancy Deep Greyish Blue, Fancy Light Greenish Blue, Fancy Intense Greenish Blue. 3rd row: Fancy Vivid Greenish Blue, Fancy Green- Blue, Fancy Intense Green-Blue, Fancy Vivid Green- Blue, Fancy Deep Green- Blue, Fancy Greyish Greenish Blue. In the event of a secondary hue, a Fancy Dark intensity is also possible. As a result of the color saturation, blue diamonds vary from the pale blue, to brilliant blue, to intense blue shades of color. The further along this spectrum you go, the richer and more intense the blue is to be seen in the diamond. The more intense a diamond's color saturation, the more it will be worth. For example, a Fancy Intense Blue diamond will be worth more than a Fancy Blue. That said, apart from very saturated pure blues, stones that are a split grade containing an equally rare color of highest saturation, such as Fancy Vivid Green-Blue, are among the most desirable and valuable types of natural blue diamonds. Tone refers to the lightness or darkness of a blue diamond, and the continuum in between. GIA grading does not make a distinction in tones, but to the eye a stone with darker tones may appear more intense in color. For someone looking for the appearance of a Fancy Intense Blue without the price tag of one, a good option may be a Fancy Blue with a darker tone. Blue diamonds do not have a tendency to exhibit fluorescence to UV light. On those rare occasions when they do show fluorescence, the resulting color is faint and typically a dusty blue to green. In the final analysis, the enhancement to a stone's aesthetics that fluorescence offers is entirely subjective. In contrast to the vast majority of colored diamonds, fancy blue diamonds frequently have high clarities. The inclination towards a superior clarity is usually a result of the flawless composition of the diamond in its rough state. However, As with other fancy color diamonds, because of the acknowledged rarity and value of blue diamonds, a blue diamond's clarity is far less of a consideration than actual color and intensity. Because round cuts tend to produce lower color saturation, blue diamonds, like other colors, are generally cut into fancy shapes such as pear shapes, radiants, cushions, etc. Round cuts cause color desaturation because they are best at reflecting white light. In the case of blue diamonds, a round cut may make the blue color appear fainter, whereas a fancy shape, which reflects less white light, will maximize color saturation. Take note of uneven color distributions as well (these will be noted on your GIA certificate), as they can certainly affect a diamond's appearance and value. Natural blue diamonds enjoy a perch at the top of the hierarchy of rarity. They have historically been some of the rarest and infrequent color diamonds to appear on the market. The De Beers mine in South Africa has seen only one major fancy blue diamond emerge every year, merely underscoring the true dearth of blue diamonds that are available. The exceptional rarity of blue diamonds thus makes them highly valuable. Needless to say, natural fancy blue diamonds represent excellent investment opportunities. The best investment choices for natural blue diamonds will be those that have deeper color saturation and the largest size your budget can accommodate. Color, size and clarity are the biggest factors that determine the blue diamond price. A color diamond is generally rare when it exists as one color without any additional modifying colors. The only instances that color in fancy blue diamonds experience even greater rarity and value than if such diamonds were to have just its primary color of blue are when the primary blue color is combined with equally, if not more, rare colors such as green and violet. A "fancy violet blue" of considerable saturation will therefore be a lot more rare and valuable than a color diamond that has only blue in a comparable saturation. Blue diamonds first originated from the Hyderabad region of India during the 17th century. India was responsible for the mining of nearly all gem diamonds during this prolific period. Four hundred years later, the Indian mines have experienced a drastic slowdown. The greater majority of the world's blue diamonds now come from the Premier mine in South Africa. Another very famous fancy blue diamond is the Wittelsbach-Graff. I was an exquisite diamond of an unusual pattern of 82 facets with a Fancy Deep Grayish Blue color and a VS2 clarity grade. It's total weight was 35.56-carats, making it very large especially for such a rare diamond. In 2008, Laurence Graff, a famous jeweler, purchased the Wittelsbach Diamond at the Christie's auction for $24.3 million. Laurence Graff re-cut the diamond, losing 4.45 cararts, to a 31.06-carats. He removed some "damage" to the girdle and managed to enhance the color of the stone. The diamond, now renamed the Wittelsbach-Graff, is now a Fancy Deep Blue, IF (Internally Flawless) stone.